From the Main Page of the 2005 The Economic Fractalist …..
….. The ideal growth fractal time sequence is X, 2.5X, 2X and 1.5-1.6X…. A sudden nonlinear drop in the last 0.5x time period of the 2.5X is the hallmark of a second cycle and characterizes this most recognizable cycle. After the nonlinear gap drop, the third cycle begins. This means that the second cycle can last anywhere in length from 2x to 2.5x. Most of the cycles are caricatures of the ideal and conform to Gompertz mathematical type saturation and decay curves. This page was last updated on 15-May-2005 01:21:59 PM . 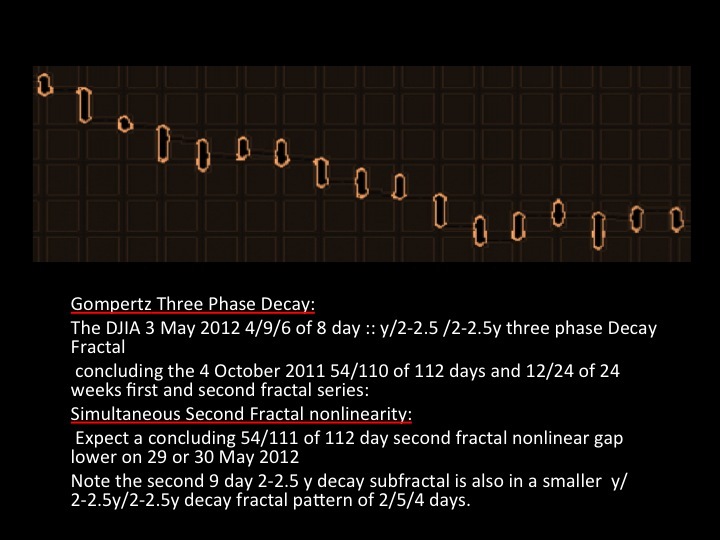 Q1: Where/When is the expected 4 October 2011 Wilshire 12/24 week x/2-2.5x second fractal nonlinear lower gap? 4Q2: Where/When is expected the Quantum Fractal Gompertz decay pattern of y/2-2.5y/1.5-2.5y and how is it timed with the 4 October 2011 second fractal ending? A1: The week of 28 May 2012; specifically on 29 May 2012 with a probable reversal or averaged composite equity valuation low on 30 May. A2 The three phase curvilinear Quantum fractal decay pattern starts on 3 May and ends on 30 May following a 4/9/8 day :: y/2-2.5y/1.5y-2.5y fractal decay pattern. Friday 25 May 2012 was the 110th day of a 4 October 2011 54/108 -145 day :: x/2x-2.5x first and second fractal series. its associated equity market, has a thinned out base of speculators and the time course of second fractal nonlinearity will be very close to the shorter 2x time of the second fractal vice the longer 2.5x. The earlier predicted pick of Wednesday 23 May 2012 as the high probability second fractal low (it is currently the low for the less weighted DJIA) was based on its 108th day location after a 4 October 2011 54 day base. Even the Wilshire’s 4 October 2011 54 day base composed of a 11/28/17 day x/2.5x/1.5x fractal series showed profound and collapsing debt-money-asset system weakness, falling considerably below the expected lower limits of 13 October 2011. The 4 October to 18 October 11 day first subfractal of the 11/28/17 day series is composed of two fractals: 2/4/4 days ending on 13 October and an interpolated 11 October 2/4/(3) day interpolated fractal ending on 18 October 2011 with only the first 2 subfractals of 2 and 4 days comprising the series first 11 day fractal and the (3) follow on days integrated into the interpolated 28 day second fractal. 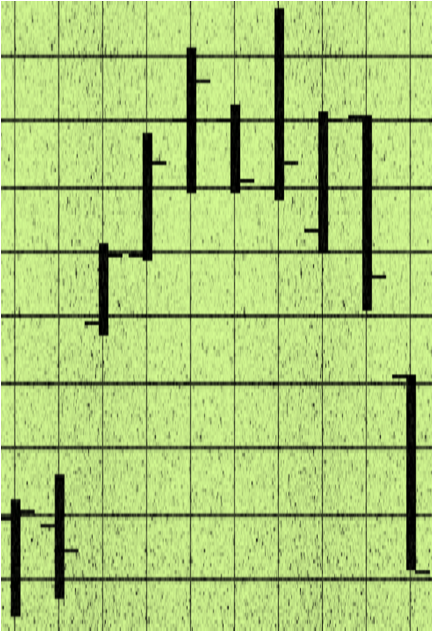 The 28 day second fractal low ending on 25 November 2011 was below the low of the 12 October 2/4/3 day series. 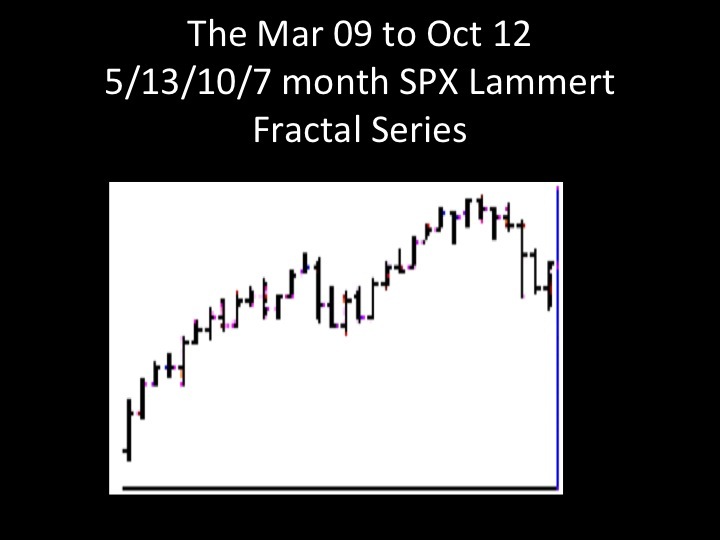 On a weekly time unit basis the October 2011 first fractal was 12 weeks composed of 3/8/5 week series (11/28/17 days). Normally for a growing composite valuation debt-money asset system, all of the first fractal lows would be contained above the underslope line between the 1st week low and the 12th week low of the series. The skeletalization with the 8 week second fractal low falling below the underlying slope line between the first and twelve week shows the weakness of a high probability finale August 2012 high pattern where debt (52 trillion alone in the United States and internationally linked thru derivatives) in the macroeconomic system is importantly counted as an asset by the system’s ultra weathy debt holders. That debt with the compounding of interest, stagnant job growth, falling collateral asset valuations is now undergoing debt-money-asset macroeconomic system inevitable negative feedback default. The composite wealth of the system comprised of debt, money, and asset valuations totally about 190 trillion in the US is interlocking and integratively supports deterministically and mathematically and in a quantum fashion the valuations of the individual existing asset class elements including ongoing equity and commodity valuations. Real estate is a key asset in the debt money asset system because it represents both a solid collateral of debt and with historical growth and real estate asset inflation represents a major saving asset of the wage earner. As well growth in the real estate sector is a multiplier of related jobs and economic activity. Importantly (ongoing growth in jobs) and the resulting wages represent a major asset of the system serving as the foundation collateral for both new debt expansion in a forward consumption based economy and debt retirement. In a forward consumption based debt-money-asset economy where a real estate bubble in both supply and valuations has occurred, the implications of a slowing growth of jobs and non servicing of existing debt may (does) requires a Keynesian approach. are infrequently traded, composite equities, sovereign debt, and commodities are traded in discrete units and on high volume fashion. The resulting time based fractal growth and decay quantum patterns of these asset valuation saturation curves represent the quantum naturally occurring feedback and limitations of the composite debt-money-asset system. The time based feedback growth and decay saturation patterns of the debt-money-asset system are so regular that the patterns represent the science of the macroeconomic system. As of 25 May 2012, the 4 October 2011 Wilshire’s low first and second weekly fractal series is 12/23 of 24 weeks. The likely 19 December 24 week second fractal of the 4 October 12/24 week first and second fractal series and starting on is composed of a 4/9/8/5 of 6 weeks :: a very classical x/2-2.5x/2x/1.5x series. For the DJIA the low of 23 May 2012 will exist near a temporal midpoint of an interpolated 18 May 2-/4-/4-/1 of 3- day series ( 21 and 23 May are upgoing valuations and are empirically counted twice) The final sequence of 2-/4-/4-/1 of 3- days will complete a 54/112 day 4 October 2011, 19 December 2011 first and second fractal sequence and a 4 October 2011, 19 December 2011 12/24 wee fractal sequence. Notice also the Gompertz like 3 May 2011 4/9/6 of 8 day equity valuation decay curve (y/2-2.5y/2-2.5 y) reaching a saturation low in a reciprocal similar Gompertz fashion as are the saturation curvilinear highs reached.